When you think of Olympic athletes, what words come to mind? At Integrative Nutrition, we think of inspiration, dedication, and determination, to name a few. Nicolle Payne, two-time Olympic medalist and IIN graduate, has demonstrated all of the above - turning her passion for health and fitness into a fulfilling new career! Having recently left her job in Corporate America, Nicolle is channeling her energy and athletic expertise into the field of Health Coaching. She recently started her own business, Ride the Wave Nutrition, with the goal of providing Olympic-sized support and encouragement to her clients. Prior to enrolling at IIN, I was working for an Investment Banking firm in New York. Before that, I spent twenty years training and competing for Olympic level water polo. I competed in the Sydney 2000 Olympics and the Athens 2004 Olympics. I earned a silver medal and a bronze medal! That’s quite an impressive background! What inspired you to explore the Health Coach Training Program? My stepfather passed away very suddenly last June after losing a battle to Pancreatic Cancer. I have always been interested in nutrition due to my sports background, but after losing my stepfather I was determined to make changes in my own life as well as creating a life to benefit others. Enrolling at IIN was a major turning point in my life. I had been looking for something that I could be passionate about since I was no longer competing in the Olympics. Now I have all the tools to be successful, and I can apply energy to something really meaningful to me. The biggest change was increased awareness. My health improved, and my family’s health improved as well. I am increasingly aware of the health and happiness of everyone around me. Which teachers had the greatest impact on you? I really connected with Dr. Joel Fuhrman and Dr. Mark Hyman. I also really enjoyed learning from Deepak Chopra. I wish I had discovered him when I was still competing in the Olympics. You mentioned your connection to Deepak's teachings. Can you share one of his lessons that you will use to encourage and inspire your clients? I heard Deepak Chopra speak at the IIN conference in NY. He spoke about leadership and the soul, and his words really resonated with me. I was often told that I was a quiet leader on all of my sports teams, someone who led by example. I am confident that the leadership skills I developed as an athlete will translate into my health coaching practice. I graduated from IIN in June 2012, and I left my job in corporate finance in July 2012. I am currently in London at the Olympic Games, reconnecting and networking with other athletes and coaches. In September, my partner and I will be moving to San Francisco where I will be working as a fulltime Health Coach. My experiences as an Olympic athlete will be invaluable to my clients. My target market includes young professionals who love sports and continue to compete on some level. From marathon runners and triathletes to weekend warriors who play for their company softball teams, I am excited to connect and support people in achieving their goals. What is a key factor in determining your clients’ success? 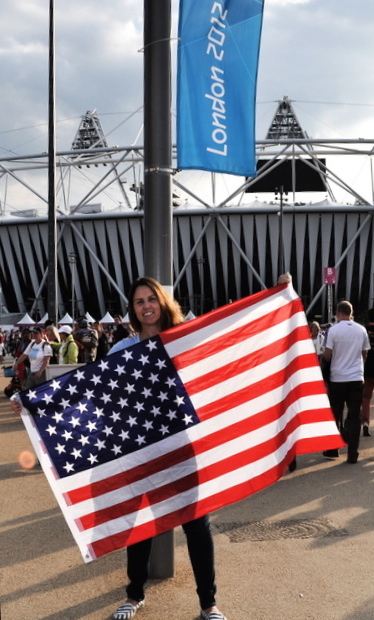 While in London for the 2012 Olympics, I have seen firsthand the power of support. It is incredible what you can accomplish with the right support system. I will take that support system and apply it to health coaching! I love small changes that lead to huge changes. Seeing those changes in clients is so rewarding. What are some small changes you've made in your life that have turned into bigger changes? One of the small changes that I have made since studying at IIN is learning how to nurture myself. As an Olympic athlete, the mentality is often to push yourself above and beyond the limits at all times to achieve your goals. Since retiring in 2004, I have been working on finding a healthy balance. After traveling the world with sport, I have learned that the whole world needs Health Coaches, especially in the stressful environment of corporate America.